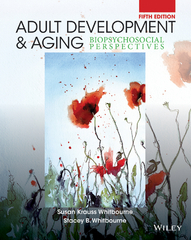 Adult Development and Aging 5 Edition The Fifth Edition of Adult Development and Aging: Biopsychosocial Perspectives continues to provide psychologists with a fresh and engaging approach to the field of psychology of adult development and aging. The text's main themes, explained in Chapter 1, are consistently applied throughout the text with specific examples, including maintaining a focus on identity. This approach helps readers develop a deeper and more conceptual appreciation of the material. Recent articles and updates to the information on demography, economics, and public policy are presented, and updates have been made to the statistics on demographic, health, and mortality. An "Applied Gerontology" feature shows how each topic can be used in everyday life, and sections on intelligence and personality assessment have been updated to include the most recent revisions of the WAIS, MMPI, and computerized assessment tools. Psychologists appreciate this mix of examples and discussions that make the material come to life.